Suddenly there was this wish to visit a Temple which is located far from maddening crowds and one that has few visitors. Meanwhile planned a visit Tirumala and made all the arrangements. Before we actually left for to Tirumala , I was casually scanning the Internet for other sightseeing places located in and around Tirumala. Places that we could visit during half a day. Came across several interesting places including Akasaganga, Paapanasam, Srivaari Paadalu, Natural Arch formation , Museum etc. We had visited all these places several times during our previous visits. This time I was curious about this temple named ‘Jabali/Japali Theertham’ ,which we had never visited . I might have overlooked this in my previous scans . The place is around 3km by road, from the main temple.It is said that a sage named Jabali meditated here and had the vision of Lord Hanuman. We had half a day at our disposal and decided to go there. Reached the entrance to the Temple in a car in less than 10min. Driving through the winding road on the hills with the windows drawn and breathing in fresh cool air blowing through the trees all around was fun. Very soon our driver stopped at this arch . The temple was not in sight but we saw a lot of stairs .We began walking up the stairs barefoot. Thankfully the steps were not steep :). After some 50 long steps and no temple in sight , we asked a lady selling raw mangoes and cucumbers , ‘How far before we reach the temple ?’. She replied ‘Around 100 steps up and 100 steps down’. We saw huge wild squirrels , wild hens , monkeys . It was 4pm. Came across very old and tall trees as we got closer to the temple. It was a beautiful sight. We were actually in a valley . The Golden coloured Temple is ensconced in a little valley , surrounded by lush greenery with a pond (Theertham) in front of it. This pond supposedly receives a continuous trickle of water from a lake situated behind the temple. There were a few shops and hardly 20 people in and around the temple. It was a strange feeling . Woww , my wish was fulfilled so quickly. 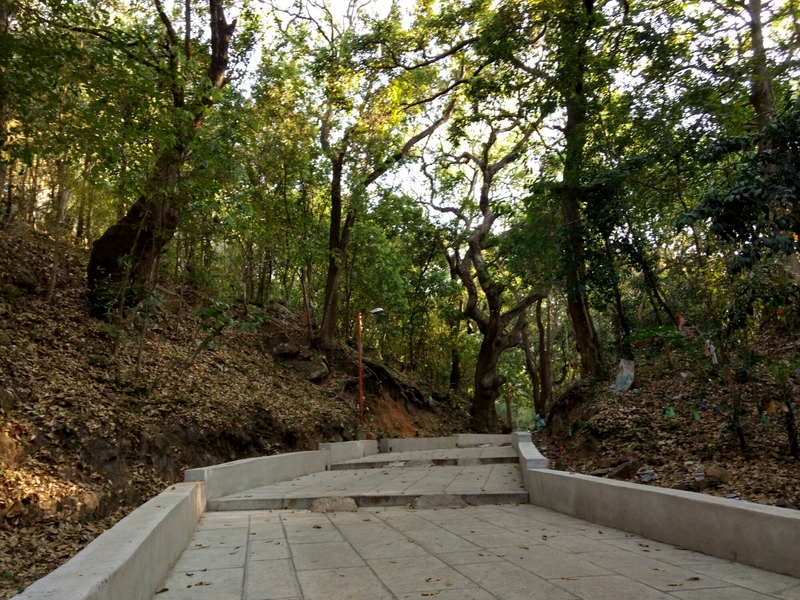 The place gives a glimpse of life in a jungle where Rishis and sadhus would have lived and meditated. The feeling is indescribable and ethereal. Loved the whole experience . As I close my eyes I see myself sitting on the stairs in front of the temple and can vividly visualize that I am surrounded by tall trees, the pond, the temple and chirping birds . It is these places and experiences which get etched in our memories and make life beautiful. A must visit when you are in Tirumala. 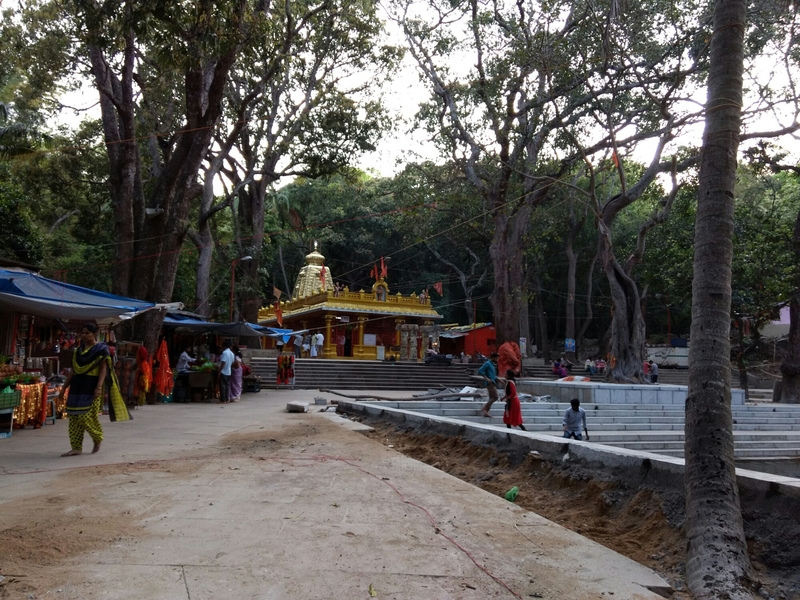 Categories: travel | Tags: Hanuman Temple, jabali, japali, temple, theertham, Tirumala | Permalink.